The average person uses 10% of their brain capacity. Today she will hit 100%. Luc Besson is back with more of his trademark action and tough women. This time around, a young woman accidentally gets caught up in an underground transaction and is taken captive. 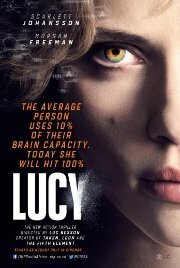 However she manages to turn the tables on her captors, becoming a ruthless killer way beyond human understanding. This film is releasing in standard and IMAX versions, this is the standard version.